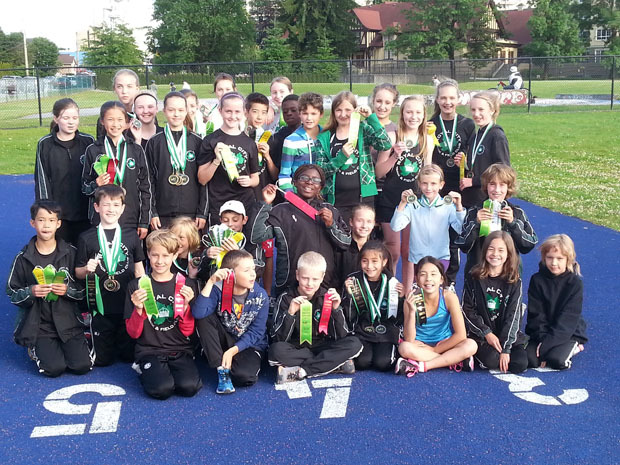 Royal City Track and Field athletes gave some stellar performances at the Jesse Bent meet in Coquitlam. The 27 athletes in a mixed squad of girls and boys in the junior development and midget age groups combined for a total of 31 medals, incuding five gold, 11 silver and 15 bronze. As well, a total of 45 top-8 finishes were achieved. Jenvieve Patry-Smith led the medal charge, winning six medals total, including a gold in the 800-metre race walk. Patry-Smith also won three silvers in shotput, javelin and high jump and two bronze in hammer and discus. Not to be outdone, Max Jones collected five medals. Jones won silvers in the 80 and 200m hurdles. He had three bronze medals in the 100m sprint, javelin and hammer throw. Grace Fetherstone-Haugh won the girls’ 1,200m race, setting a blistering pace from the start to finish with a provincial record for 12-year-old girls. Teammate Grace Vanee followed up with a convincing bronze medal win in the same race. Emily Chilton garnered a bronze medal for the same distance in the next age group up. Kate Stewart-Barnett continued her winning ways by running to gold in the 10-year-old girls’ 600m race while also jumping to first in the high jump. Pole vaulter Kinsey Weir jumped to a bronze medal while achieving a personal best jump of 2.85m. Other notable performances included Devon Strome with a silver in the girls’ high jump; Ryan Jensen with a bronze in the boys’ 80m hurdles; Jeremy Belcher with a third in the boys’ 200m hurdles; Malena Kalisch with a bronze medal in the girls’ 600 and 1,000m; Amanda Scott with a pair of third-place medals in the girls’ 300 and 800m; and Brianne Lowka with a bronze in the girls’ javelin.